Starring Edward Norton, Bruce Willis, Bill Murray, Tilda Swinton, Frances McDormand, Jason Schwartzman and Bob Balaban, the film really belongs to newcomers Jared Gilman and Kara Hayward, two kids on the cusp of their teens who fall in love on an island off New England in 1965. The pair make a secret pact to run away together and head to the wilderness, but the authorities are on their trail. Meanwhile, a violent storm brews offshore threatening the enclave. The couple are astonishingly level-headed characters, being chased down by some offbeat adults. "It's been awesome, it's been amazing, my life has really taken a turn," Gilman said before a packed news conference after the official photo shoot Wednesday morning. Anderson said he picked his two young stars after 10 months of searching, but found both in what the two-time Oscar nominee described as a magical moment. "There are many people who come along the way," he explained, "but you always hope there's this one moment and you say, 'It's this.' 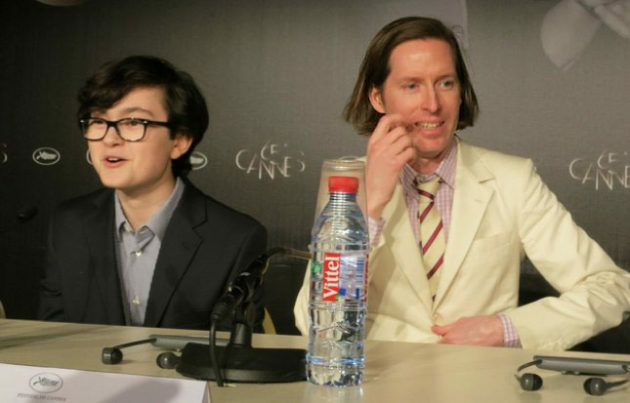 I was very charmed by Jared [Gilman] immediately. He made me laugh. As for Kara [Hayward], I had seen so many people do the dialogue over and over and it was like she had just made the dialogue up herself." Suzy (Hayward) is surrounded by a large family, including her parents (played by McDormand and Murray). Sam, meanwhile, has no family and is not among the popular kids in his Boy Scout troop. But their union throws the whole island into a frenzy. "I used the memory of what I wanted to have happen as a young person," said Anderson, who wrote the script with Roman Coppola. "I remember the emotion of falling in love as a kid, and I hope it's a memory that people share. [...] Part of the reason for making this film is about their [sexual] discovery. They're finding something that is beyond them, and that's where the script came from." While the script was an idealized adolescence story for Anderson, he did note there are at least some moments in the film that may have been usurped from his own upbringing. "There's a moment in the movie where Suzy [Hayward] sees a pamphlet on the refrigerator that says, 'Coping with a very troubled child,'" he said. "That is perhaps one part that is autobiographical." I want to know what kind of birds are Willis and Norton in that picture.